At Poway Auto repair, we specialize in smog inspections and smog repairs for the state of California. The Smog Check Program has greatly reduced air pollution created by millions of cars in California. According to the California Air Resources Board, the program removes about 400 tons of smog-forming pollutants from California's air every day. (smogcheck.ca.gov) With no surprise, the California Smog Check Test is known to be among the toughest smog tests in the U.S. Although greatly reducing pollution created from cars, the California Smog Check Program did not meet its expectations. Studies have shown that the program managed to only reduce the two main polluting emissions by only 12.3% and 9.8%. ( hydrocarbon and carbon monoxide )This is a great letdown since it was predicted to have lowered the polluting rate by 25%. The program is inevitably quite unsuccessful, but is still actively running in the state of California. 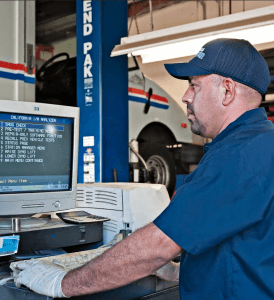 In addition, another inefficiency in this program is how the people in California only have to have their car smog checked every 2 years, so they only prepare their car before the day of inspection. Since people don't find the need to be aware of their high use of fuel emissions, they are unconsciously polluting far more than they really have to. According to the California DMV website, these counties require smog checks countywide. Alameda Butte Colusa Contra Costa Fresno Glenn Kern Kings Los Angeles Madera Marin Merced Monterey Napa Nevada Orange Sacramento San Benito San Francisco San Joaquin San Luis Obispo San Mateo Santa Barbara Santa Clara Santa Cruz Shasta Solano Stanislaus Sutter Tehama Tulare Ventura Yolo Yuba These counties require smog check only in certain zip codes. El Dorado Placer Riverside San Bernardino San Diego Sonoma.